Learn to create unique and intricate patterns on fabric using traditional Shibori techniques with Roz Slade from Be Kind Textiles. Spend the morning folding and manipulating fabric then get your hands dirty in a natural Indigo vat! Once you have experimented with the techniques learnt, you have the choice of a Tea towel or a Tote bag to dye and take home to keep or gift to someone. You will learn about how to create and maintain a natural indigo vat, and learn about the wonderful dye that is indigo! You will get to take home all the fabric you have created, a tea towel or a bag and the knowledge to continue on by yourself. All materials for the class. Feel free to bring along any white or light coloured items you wish to dye such as clothing, scarves, pillowcases or napkins. Plain white fabric is supplied along with a plain tea towel or tote bag. Clothes you don’t mind getting dye on. Roz is a Melbourne based textile designer and maker that explores the importance of the connection people have with textiles and the appreciation for the hand crafted. After Graduating RMIT Dip. Textile Design and Development where she focused her study on sustainable materials and intricate mindful designs, she stepped away from the outward pressure put on her to create wasteful products using materials and supply chains with questionable ethics. She now prefers a slower more thoughtful design process. 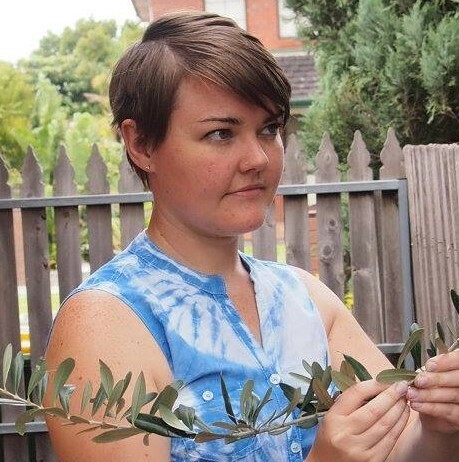 Roz teaches textile based workshops around Melbourne and Regional Victoria, hosted by a variety of organisations and venues, combining her love and knowledge of textiles with the therapeutic act of hand-making. Her label Be Kind Textiles is about what she loves doing most, creating thoughtful quality products, while using sustainable methods, ethically sourcing materials and being kind to the earth.